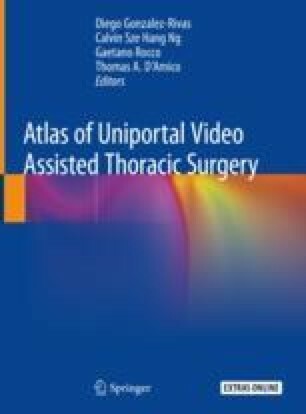 Video Assisted Thoracoscopic Surgery (VATS) for anatomical lung resection has been performed utilizing 2–4 ports in experienced thoracic surgery centers. The efforts to reduce the number of ports and incision length led to innovations in a uniportal VATS approach. These innovations have gained much popularity over the last decade. The described uniportal technique has disadvantages with regards to surgical instrumentation, ergonomic distribution of the surgical team and how a surgical trainee can be taught. Inspired by our dual port VATS approach and calling upon our experience, we have described a modified uniportal VATS technique. Our new technique also uses a single intercostal space and has potential advantages over the classical uniportal approach with a more stable camera platform, better ergonomics for the surgical team and a more productive experience for the surgeon trainee and surgeon instructor. The online version of this chapter ( https://doi.org/10.1007/978-981-13-2604-2_6) contains supplementary material, which is available to authorized users.